Welcome to the monthly French Country Design Series! 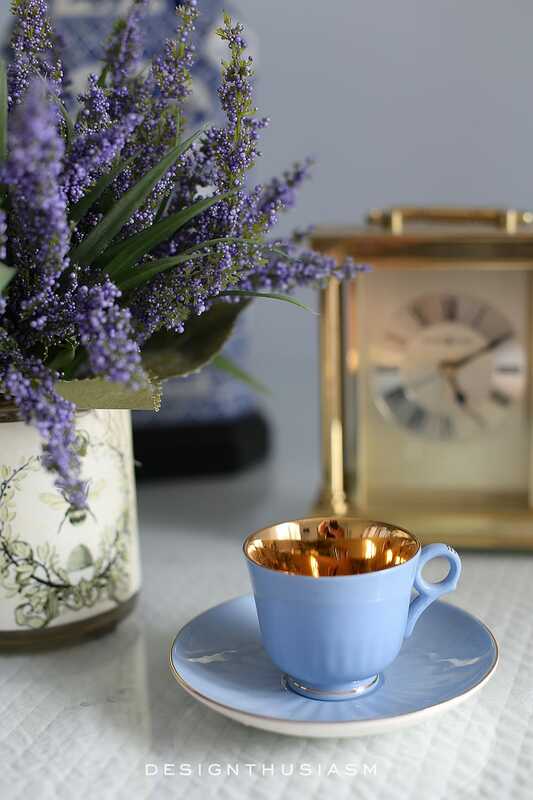 The past 3 months I’ve joined with several other bloggers to celebrate a French inspired ‘morning, noon and night’. 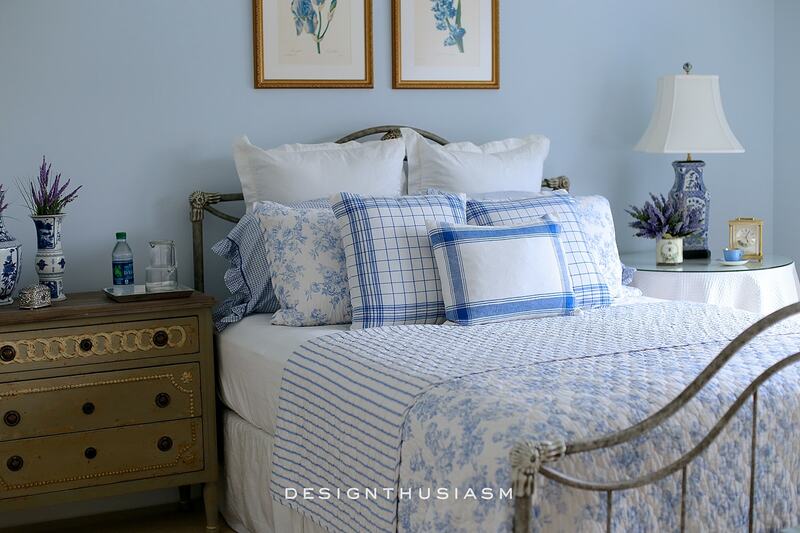 This month’s theme is night and I’m sharing my French blue guest room for a bonne nuit! An alarm clock and a reading lamp are also present on one of the nightstands. Our guest room is blessed with lots of natural light but for evening reading with a cup of tea, the lamplight is a welcome addition. Since one of the nightstands has 3 empty drawers, the rest of the room was free to furnish with pieces that are accommodating for guests. The pale blue walls set the tone for a peaceful stay with creamy whites and light toned woods sprinkled about. 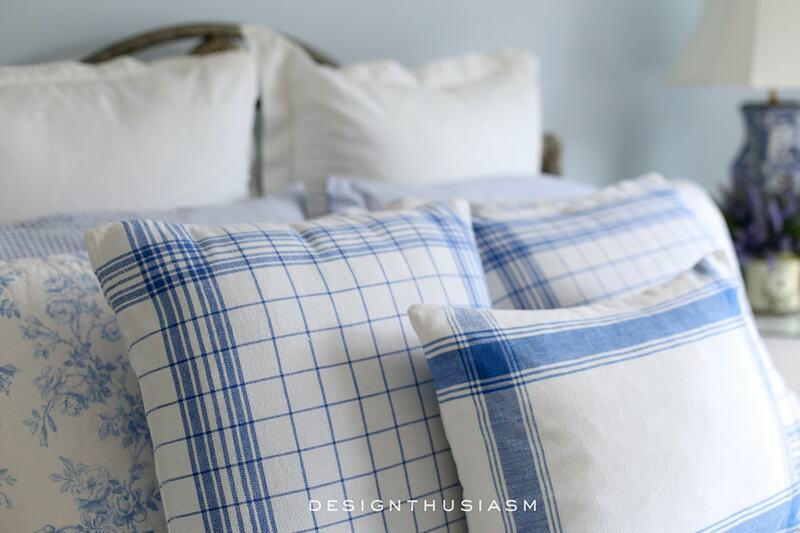 The gorgeous French blue toile pillow punctuates the space with a provençale feel. 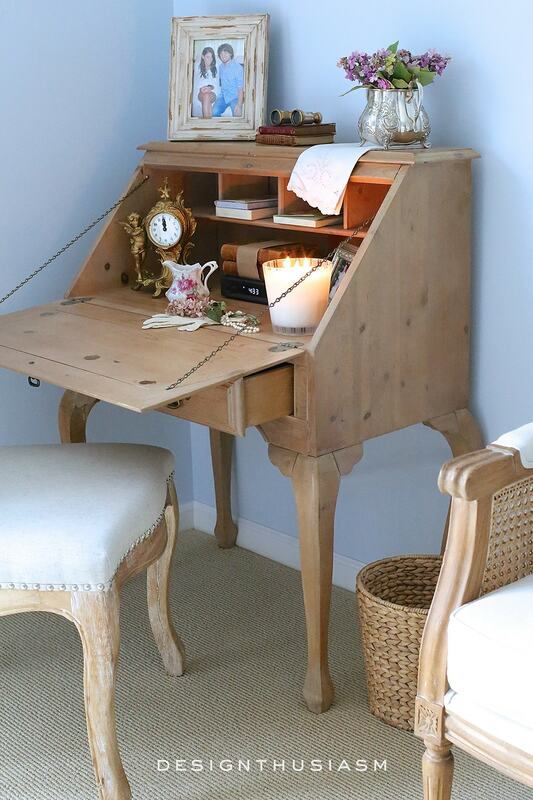 Tucked in the corner is a knotty pine writing desk, equipped with notecards and writing instruments, as well as a luscious scented candle. Above the desk is a wall mounted TV, because y’know… 21st century. 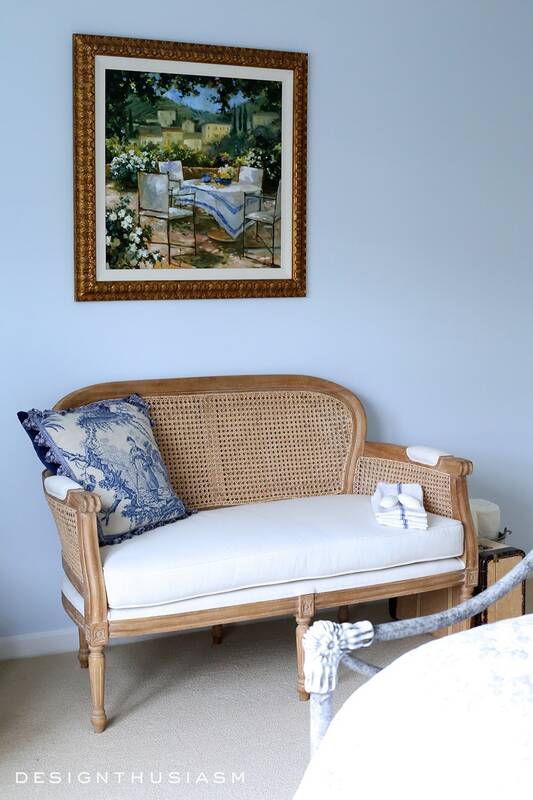 A cane back settee sits across from the bed beneath a lovely framed print of the French countryside. I keep fresh towels in the room at all times, so I never forget to leave them for my guests. I’m a huge fan of Rancé soaps and they’re a nice luxury to treat visitors well. 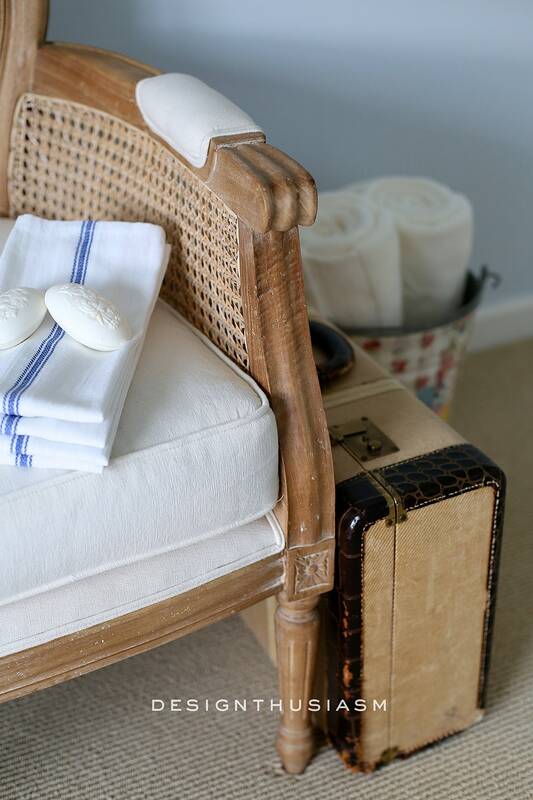 The vintage suitcase was actually passed down in our family and it’s where I keep some antique linens. The throw pillows in the front have a bit of a back story. I’ve had them, in some form, since the 1980’s. 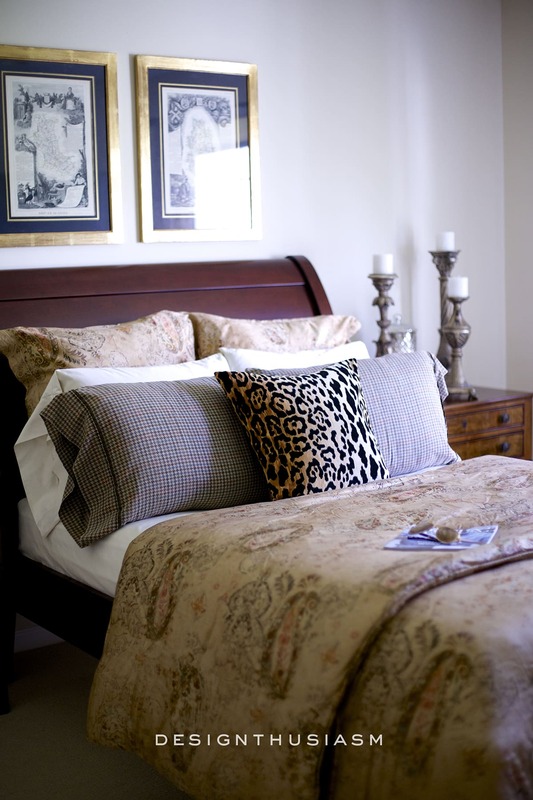 The larger tattersal ones were originally napkins and the smaller boudoir pillow was made from cotton placemats. They came from one of the first Ralph Lauren Home collections and I got them when I worked in the design department about 30 years ago! 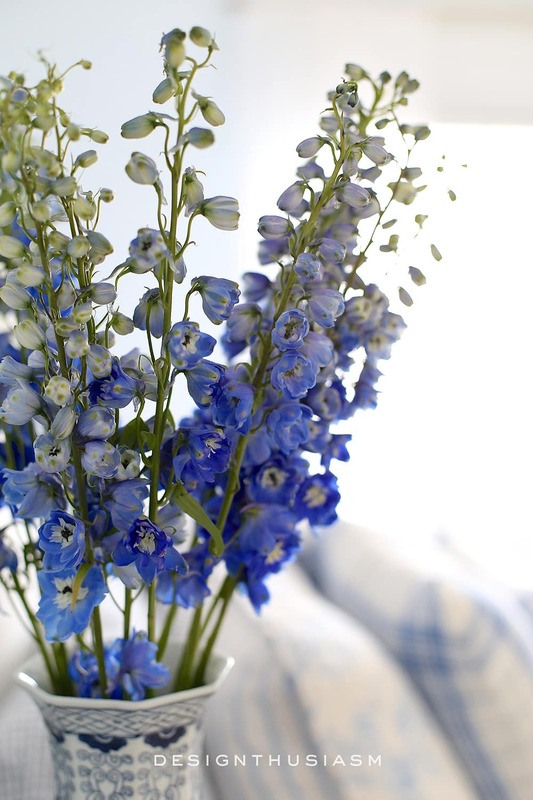 And if there’s one thing a French blue room needs… it’s delphiniums! 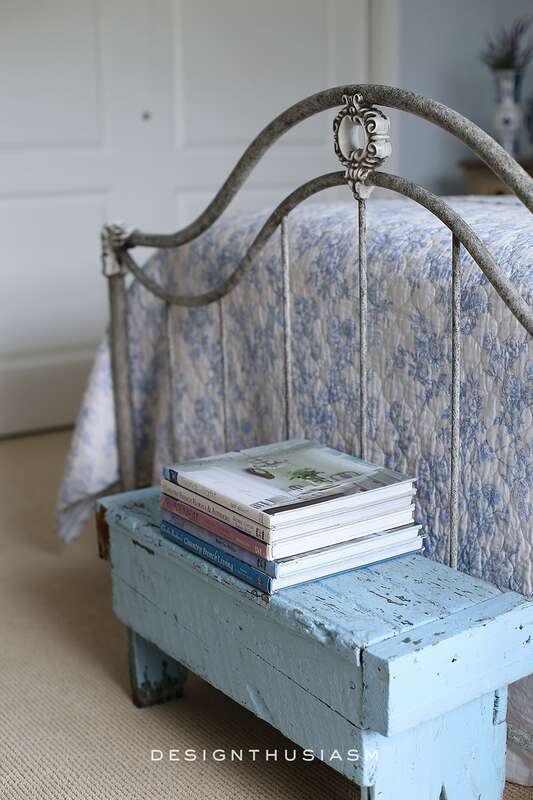 At the foot of the bed is this tiny chippy bench with some of my favorite French decor books. The hand towels are brand new but they work so well with the old textiles in the room. I love collecting aged books but I try to go for content as well as look. I search for titles I enjoy, as it adds to the pleasure of collecting antique works. It amuses me to see all my vintage pieces on the desk with the cable box! Thanks for being my guest today! So very beautiful Lory….Love how you took the RL towels and placemats and created the beautiful accent pillows. Such a most gorgeous room that any guest would not want to leave! So where is the reservation book?!! !…..So great to party with you today! Have a wonderful day! Ha ha, thanks, Shirley!! I actually think it would be really cool to have a guest sign in book, but mostly it’s my parents who stay in this room… 😉 In fact, they like to call it their room! Great partying with you, as well!! Lory, this room is gorgeous and I know your guests will be so comfortable and may never want to leave. Do tell where the hand towels and soaps are from? Thank you so much, Kim! I always love your guest room posts, so I really appreciate your comment… 🙂 The hand towels were actually one of the cheapest things I’ve ever bought (I think it was $12 for 12)… right from Amazon! In fact I meant to add the links in today and I’m glad you reminded me. The soap is from Rancé, also bought online. Can’t remember if I got them direct from the company or not, but if I can find that link, I’ll add that one in too. So glad you joined the party!! This is beautiful, Lory! I especially love your bed frame and linens~ so fresh and inviting! You’ve paid attention to every little detail and it’s charming! Thank you, Lynda! 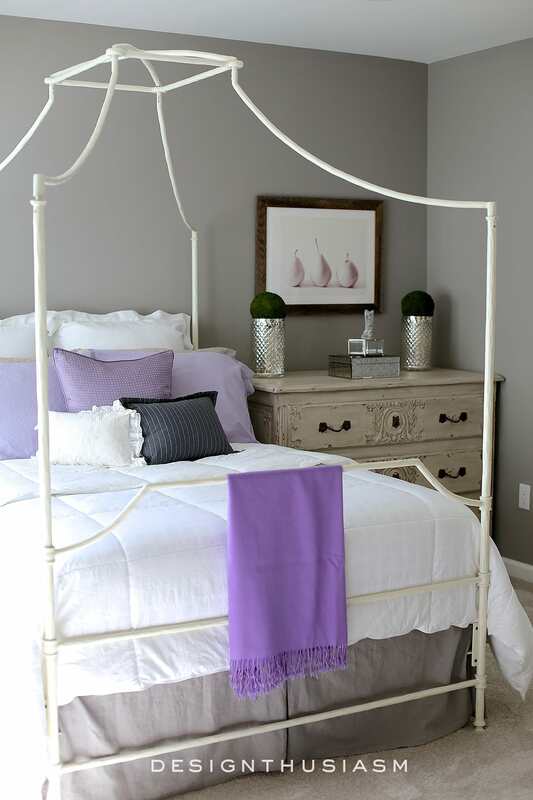 I love the bed frame too, but I cannot take credit for that one. It actually came with the house! The people we were buying from were nice enough to leave it and I knew it would go perfect with what I had planned for the room. Thanks for stopping by, as always… ? Hi Lory! 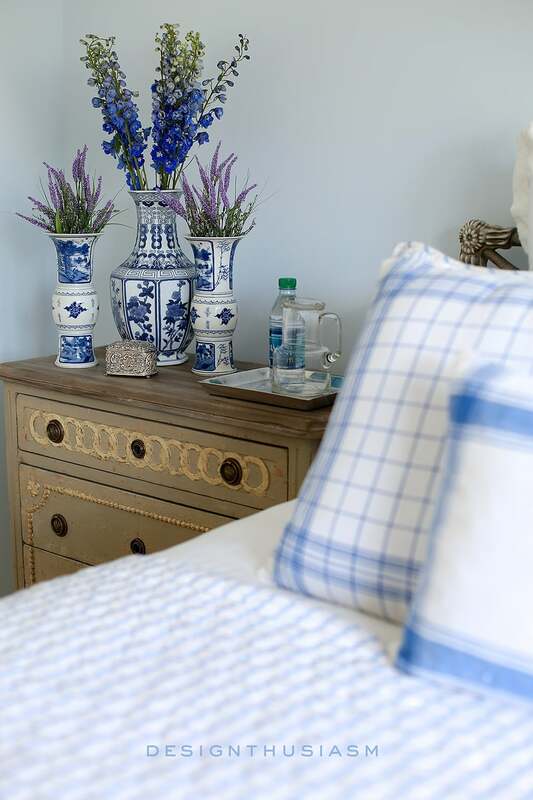 If there’s one thing a French blue guest room needs it’s delphiniums . . . and an old blue bench with great books . 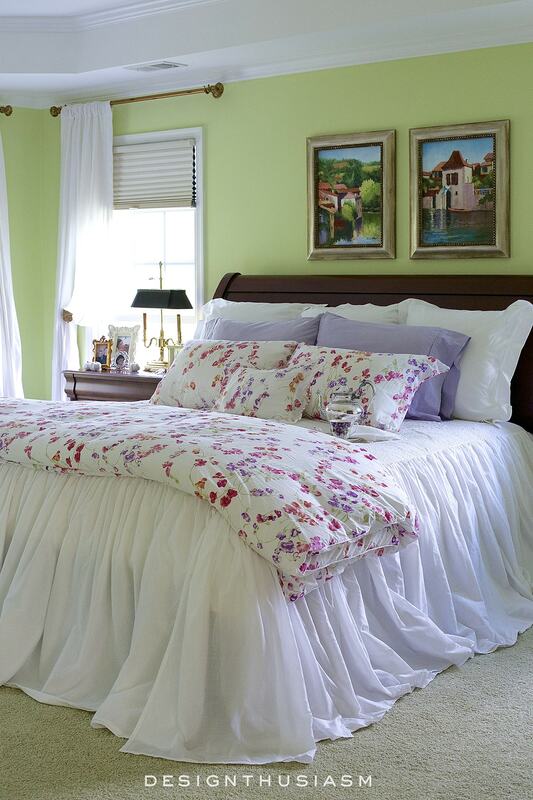 . . and lovely bed linens . . . and, well, everything in this room is just perfect. Are you taking reservations? Beautiful room, superb taste! I’m a new follower, can’t wait to see more Frenchy things. Ha ha… great comment!! Thank you so much! Delighted to have you following along and I promise there’s a lot more coming… 🙂 Thanks for visiting!! Lory: What a complete delight to be a guest in this room! I love the headboard, the linens, the wall color, the Rance soaps, the hand towels, the pillows, the tray with the water . . . I like the tablecloth on the round table, too. Oh, and the natural light! What a bonus! My guest bedroom right also happens to be my son’s room when he’s not in school, which means I still have a lot of his stuff in there until he moves out completely. I’d love to do a complete makeover on the room, but I’m also dreading letting go of he idea that, well, my son has finally moved out. One thing that I do like in guest bedrooms is a lot of empty counter space. 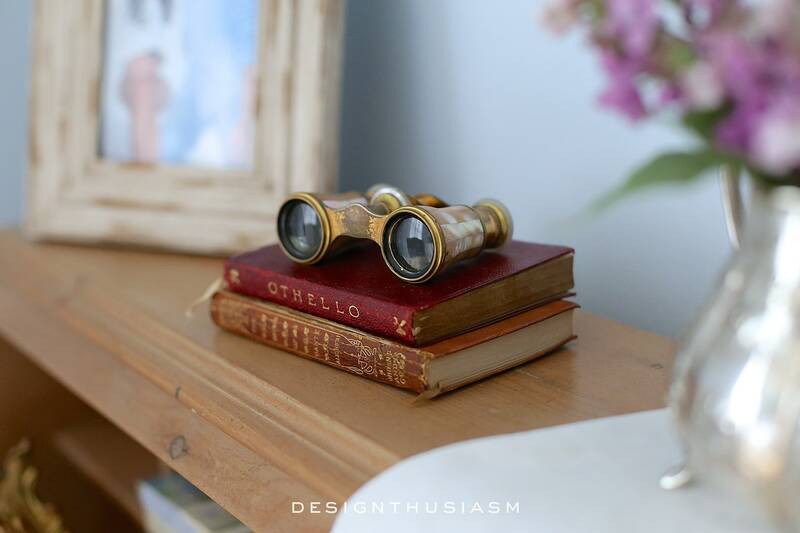 When you are traveling, you end up laying a lot of stuff on surfaces that might normally be stored elsewhere in your own home, especially the night stand. I’d need room for my iPad, glasses, phone, and water for both, me and my husband. One little touch I’ve added to my own guest/son room is an open trinket bowl. All my female guests love it because they use it to drop their jewelry in it overnight. I’ve also added a charging station so that my guests can charge all their electronics, with enough empty counter space in front to lay their things. The one last touch I’ve added is a small framed sign with the wi-if password, in case they want to connect to the Internet. My room is quite functional, but nowhere near as appealing as yours! Now you’ve gotten me excited about decorating it as a proper guest room! Thank you for so many inspiring ideas! Maria, I absolutely love the idea of the framed wifi password! I might have to borrow that one… 🙂 I, too, have 2 other rooms that are dedicated to each adult child but they don’t really live here. Fortunately both are close by and come home often, so while I did re-do their rooms, I did it with their needs in mind and both still keep a lot of their things here. I actually like it that way!! Thanks for the kind words, as well! You put it together so well. The pillows are beautiful, and what a great idea to use old place mats to make the pillow. Anyone would love to sleep in your guest room. Thank you, Rose! I’m so glad I got to use the old textiles for a new use… 🙂 Glad you appreciated the post too!! As usual, lovely, comforting and beautiful!! Thank you so much, Marcia, for such a thoughtful comment! I love that you noticed and appreciated all the details… 🙂 So glad you stopped by!! Your design of this room is so inviting and is done in my favorite style too! I used to sell the soaps in my store years ago. Rance soaps from Provence France are not inexpensive but they are heavenly scented and well worth the price. They also last a long time. Having said that I am wondering if everything else in the beautiful room are somewhat as expensive? 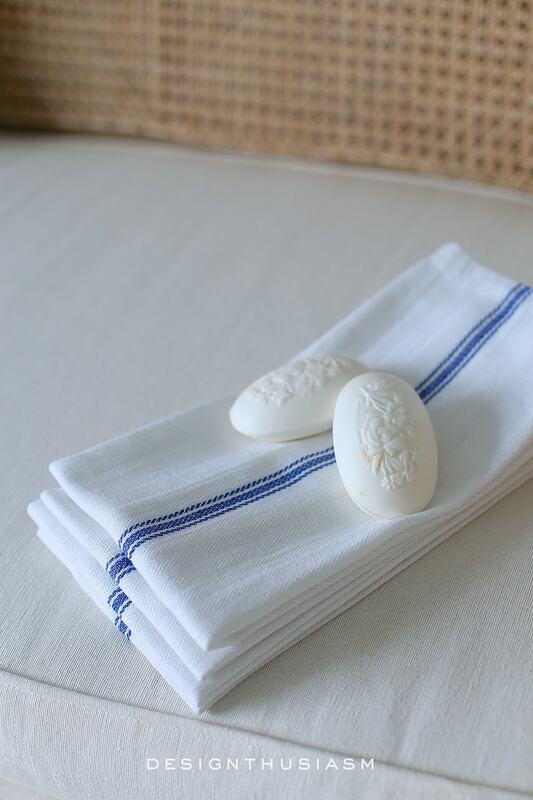 Can you share with us where you bought your linens? Can I come live with you for about a month? I will gladly stay in this room! I just want to follow you around and watch you work.? Thank you so much for the kind words, Christine!! You ask a very interesting question that I’ve been meaning to address on my blog. (Maybe will be an upcoming blog post, in fact!) 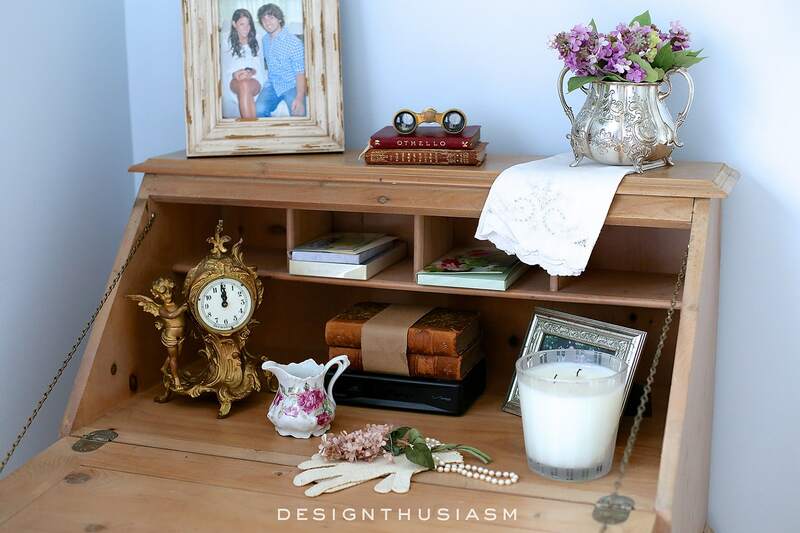 I tend to mix very inexpensive pieces with somewhat more costly items so that the blend looks well balanced. Generally the place to spend money, in my opinion, is on small luxuries like the soaps, because they make life more enjoyable but the total investment is not that high. I’d rather buy a reproduction piece of furniture and save thousands, and then have plenty left over to spend $60 on soaps… 🙂 That said, I also think a few really great antiques can upgrade the look of your home, so that if you mix in some less expensive pieces, they’re not that noticeable. In this guest room, in particular, I don’t think there’s anything that’s terribly expensive. The bed we got for free from the previous owners. Most of the other furniture are new pieces from online resources and the bed linens I got from ebay! I’ve been meaning to go back into the post and add sourcing info, so I will definitely try to get to that this weekend. Thanks again for your wonderful comment! This is so pretty! Thanks so much for sharing at Thursday Favorite Things Blog Hop! 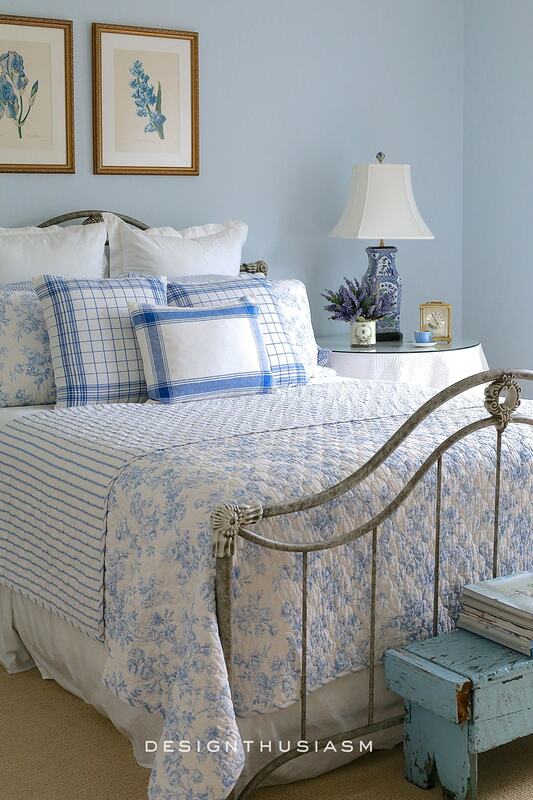 Blue is my favorite color and this bedroom is lovely. Who wouldn’t enjoy staying in this beautiful guest room! Every detail is wonderful. How lucky that you ended up with the bed frame from the previous owners. I never would have noticed the cable box had you not mentioned it- very cleverly disguised! My favorite is the quilted coverlet- love the two patterns and color. I’m sure your guests love this room! Thanks, Liz!! Yes, we were so lucky about the bed frame… 🙂 My guests definitely love the room, but that’s because most of the time it’s my parents staying in there and they’re just happy to be here… lol! This room is beautiful. Would you share information on this bedding please? Absolutely stunning! Every detail ties nicely to the next…what a welcome retreat for your guests. I love the room. I am presently changing my guest room from Americana to French country and have been searching for more ideas. Going slowly since my 11 yo grandson is here for July and there is no hurry to dress it up as yet. Thanks for the inspiration. It’s my pleasure to share, Linda… 🙂 Enjoy your time with your grandson and your upcoming decor changes! Thanks for visiting!! 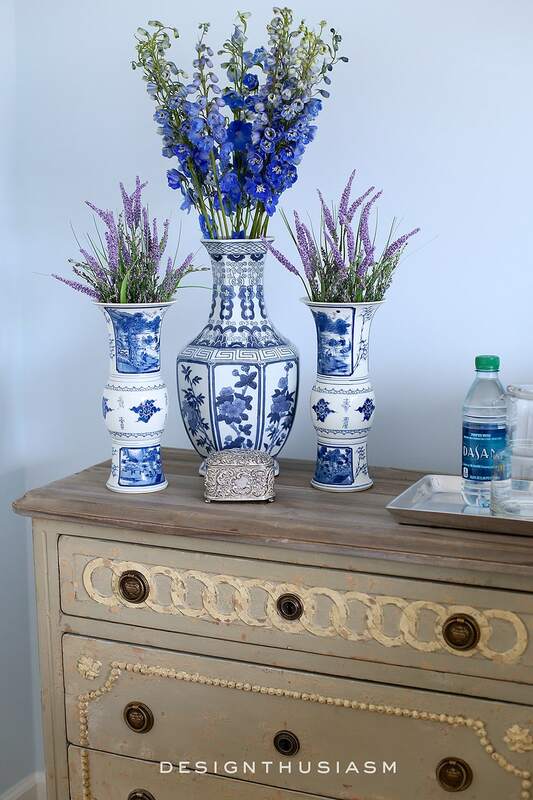 I absolutely love your blue room and I love the botanical prints. I found the prints on Etsy. I was wondering what size frames you have and where did you get your frames? Hi Marsha, I just measured and the frames seem to be an odd size, so I must’ve had them made. I usually just go to Michaels to do that (when they have their sale), because they’re just regular frames. The size 15 1/2″ x 19 1/2″ and they have an off white mat. Thank you for your reply. Are the prints 8 x 10 or 11 x 14? Sorry for the delayed response but I had to climb back up and measure. they’re 11”x15” showing with a mat around them (so probably the original is larger). What a gorgeous guest bedroom! 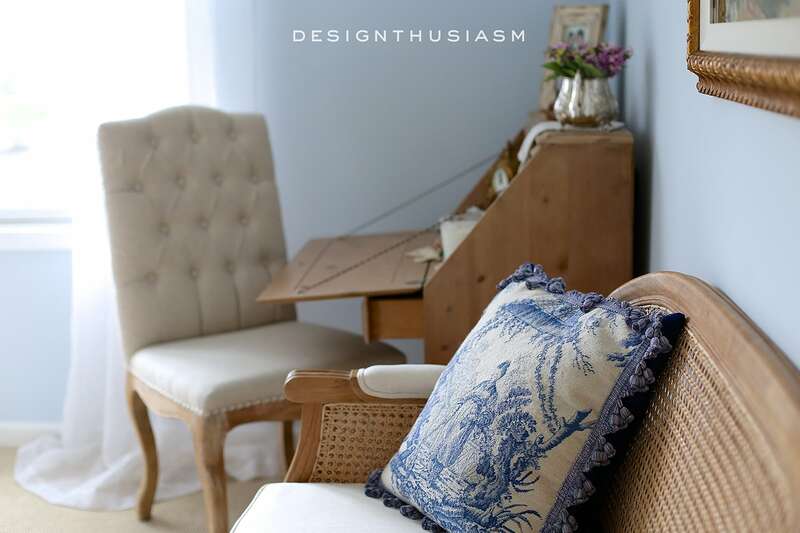 I love the mix of patterns on the bed and the pine writing desk is so pretty! What color and brand is the blue paint? Just the color we are looking for. The paint is Benjamin Moore, Sweet Bluette 813. I knew someone would correct that… 😉 Thanks! I love this room, it has been the inspiration for our master bedroom. Everything about it is calming and beautiful. Gorgeous gorgeous Lory! Love those blues!